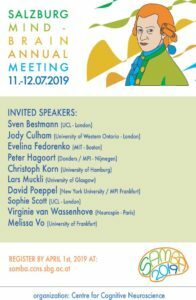 The Centre for Cognitive Neuroscience (CCNS) at the University of Salzburg announces the 3rd annual meeting in the domain of Cognitive Neuroscience, the so-called Salzburg Mind-Brain Annual Meeting or simply SAMBA. The mission of SAMBA is to attract the most exciting researchers in the domain of cognitive neuroscience, including related fields (e.g., computational modelling, animal neurophysiology, neurology etc.) that influence or are influenced by developments in cognitive neuroscience. Furthermore, our goal is to make young scientists enthusiastic about this research field. The moderate size of an anticipated ~100 to 150 participants will enable an intimate atmosphere with ample opportunity for exchange. Copyright © 2019 CCNS. Powered by WordPress. Theme: Spacious by ThemeGrill.